This is quite different from whole organ replacement. This technology will soon be able to print custom-made replacements for damaged cartilage. This novel bioprinter utilizes two low-cost fabrication techniques to produce a structure that is both durable and biologically active. 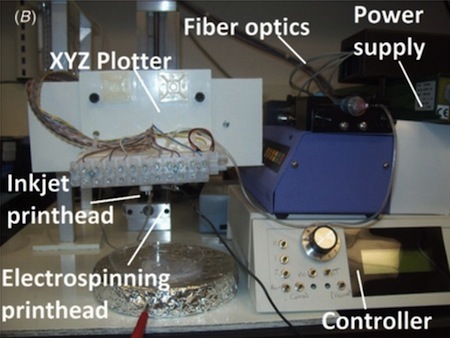 An electrospinning machine uses an electrical current to generate very fine fibers from a polymer and create a strong, porous structure. Next, a common inkjet printer deposits layers of natural gel and a solution of cartilage cells into the structure. The result is a hybrid synthetic and natural cartilage construct that developed mechanical structures and properties similar to actual cartilage after eight weeks of implantation in mice. Researchers are optimistic that doctors will soon be able to MRI scan a part of the body and custom-fabricate a cartilage construct to be implanted in patients. Fans of Larry Niven recall his artificially grown organs from A Gift from Earth and Dickheads of course recall the artiforgs from Ubik.